This is the best news that I've heard from American Idol in a long time! 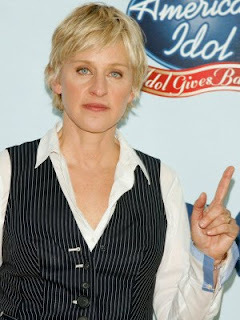 Ellen DeGeneres will not be a judge on American Idol for next season after just one season. I found out via facebook from World News Now. The worse news that has come to American Idol is still true though. Simon Cowell will not be returning to the show. We'll stuck with 2 judges remaining: Kara and Randy. Idol producers are still looking for a replacement for Simon Cowell. No word from the producers if a 4th judge (Ellen's spot) will be replaced. Hopefully for the sake of the show the 4th judge will not be added.